Without doubt, this is the most famous bridge in Prague. It crosses the river Vltava and dates back hundreds of years. It’s a pedestrian bridge with cobbles and statues along the way. The bridge has three impressive towers too and we’d recommend climbing the tower at the Old Town end for a great view of the river, the bridge and Prague Castle. During the day, the bridge is bustling with tourists and is lined with artists selling their work. You’ll recognise the bridge from many films too like the Tom Cruise version of Mission Impossible. This is an extract from our free Prague City Guide. The bridge dates back to 1357, although construction wasn’t completed until the 1400s. It is 516 meters long, nearly 10 meters wide, rests on 16 arches and has around 30 statues which were added around 1700. We loved laid back atmosphere on the bridge as although everyone is walking along it, few are in any rush. In fact, in busy times, even if you are in a rush, it’s so crowded that you just have to “go with the flow”! We’d recommend returning at night when the bridge is much quieter. The Old Town bridge tower is open daily from 10am, closing at 10pm in the spring, summer & autumn and 8pm in the winter. Adult admission is 75 CZK (2012 Prices). The Lesser Town (Mala Strana) bridge tower closes an hour earlier and is the same admission price. 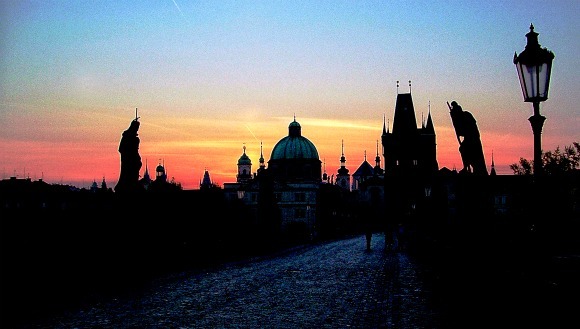 Charles Bridge is featured in the Prague In One Day Sightseeing Tour. 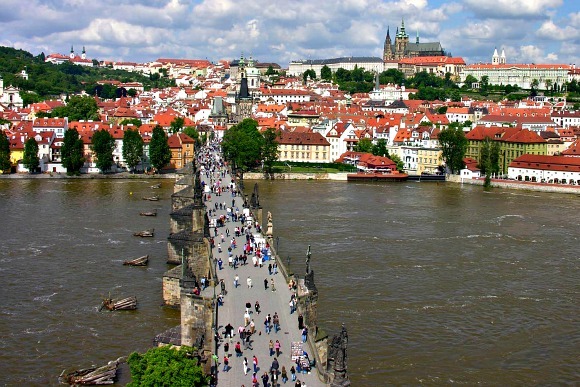 Charles Bridge (Karluv Most), is between Mala Strana and the Old Town, Prague 11000, Czech Republic.